Get ready to see 30+ storey buildings around the Aldershot, Burlington and Appleby GO stations, should council approve the proposed plans for redevelopment around the stations. 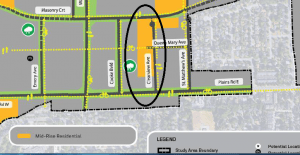 11-storey buildings are also still proposed for Clearview, a single family home neighbourhood in Aldershot, and 19 and 11 storey buildings are proposed along the east side of Brant St, south of Maplewood, adjacent to a low density neighbourhood. 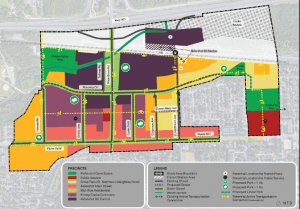 30-storey residential buildings are also proposed south of the CN rail, east of Appleby, across the tracks from industrial uses including a pork processing plant. The plans go to Council July 16 at 6:30pm for information. The motion will come forward at the same meeting for approval. Residents can attend and Register as a Delegation to speak at the July 16 City Council meeting 6:30pm. 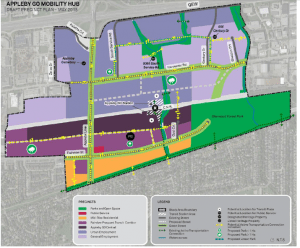 Final decisions on the plans for the mobility hubs are expected to come to the new council in early 2019, after the Oct. 22 municipal election. Ask all candidates where they stand on the proposed GO station plans. 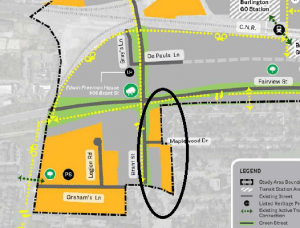 Each of the hubs have been given a boundary within about 800 m of the GO station. Within that boundary are separate “precincts” each with their own land use designations and height/density permissions. Each of the hubs has seven different precincts, including residential, commercial, parks and public service areas (eg. 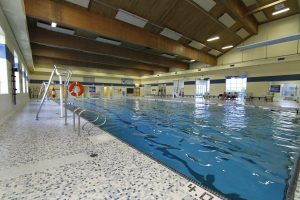 schools and community centres). Grove Park / St. Matthew’s Neighbourhood Precinct (Light Yellow); allows singles, semis, and street townhouses. Aldershot Main Street Precinct (Salmon); allows six storeys on the north and up to 11 storeys where not adjacent to low-rise residential areas; six storeys on the south. 5. Mid-Rise Residential Precinct (Orange); allows up to 11 storeys. This precinct formerly included the west side of Clearview, an existing low density residential area;. This area has now been added to the Grove Park/St. Matthew’s Neighbourhood Precinct. 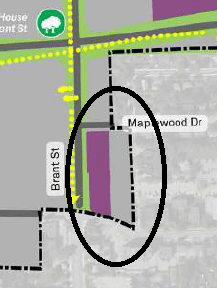 Emery / Cooke Commons Precinct (Light Purple); maximum height of 19 storeys; two uses (eg. residential and commercial) required. 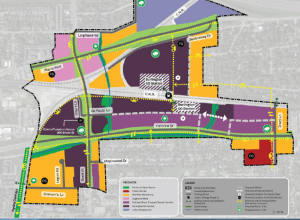 Aldershot GO Central Precinct (Dark Purple); maximum height up to 30 storeys, two uses, retail/commercial/service at grade. The Ontario government in The Big Move recognizes two Mobility Hubs in Burlington: the Downtown Mobility Hub is identified as an Anchor Mobility Hub and the Burlington GO Mobility Hub which is identified as a Gateway Hub. The City’s adopted (not approved) Official Plan identifies all three GO Stations and the downtown as Mobility Hubs, so the city has two more than designated by the province. My Take: The committee meeting should have allowed delegations to provide input to all members of council on the GO station plans. I made that case to planning and clerks, to no avail. Anyone wishing to provide input can do so at the July 16 City Council meeting. Burlington GO: The 19 and 11 storey heights along Brant backing onto the Robinson/Maplewood are excessive and don’t provide an appropriate transition to the low density neighbourhood in behind. 19 storeys on all four corners of Plains/Brant will seriously crowd an already busy intersection. Aldershot GO: I’m thrilled the 11 storey permission has been removed from the West side of Clearview, which never should have been included for high density. This is a stable low density residential neighbourhood and needs to remain so. Though council initially rejected my motions to keep this area low density, they have now come around thanks to community input. It’s been great for me to work with all of you to achieve this significant victory to protect the neighbourhood. There is more work to be done on this hub, but this is a big step in the right direction. Appleby GO: We must ensure that any planned or proposed residential development south of the CN Rail doesn’t compromise the industrial uses north of the tracks. We need to hang on to jobs we already have. 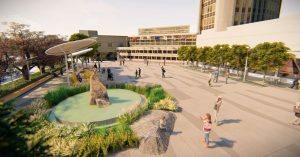 Downtown: The downtown plan, which is both a provincially designated Urban Growth Centre and Mobility Hub has already been voted on, though amendments can be made by a new council after the Oct. 22 election. I don’t believe the downtown should be a mobility hub, as it doesn’t accommodate significant regional rail transportation (bus service from Hamilton doesn’t, in my mind, make it a significant regional station). But as a hub, the downtown will experience significant pressures for overdevelopment as we have seen with the Ontario Municipal Board decision on the 26-storey building at Martha & Lakeshore, which cited the hub as one reason for granting the extra height. We also don’t need the downtown hub to meet the province’s goal of two hubs in Burlington, since the city voluntarily added two more. If we lose one, we’ll still have three hubs, one at each GO station. Should I be elected mayor, I will begin the steps with the province to remove the mobility hub designation from the downtown. Thirty stories at each GO station – really! Who thought this was a good idea. Has anyone noticed the current amount of traffic streaming west from Appleby GO, for example, from mid-afternoon onward. If this plan is approved, the city should install parking meters along Fairview and Harvester because those streets will become a parking lot. ‘Mobility Hub’ is an oxymoron, there will be very little mobility around this area. & then the city will only add to the gridlock with their incessant installation of stop lights, stop streets & stupid speed bumps!